One week on from the end of the super middleweight World Boxing Super Series final and season one of the game-changing tournament, we get to do it all over again as season three, which this time includes three weight classes (Bantamweight, Super-Lightweight & Cruiserweight), gets underway in Yokohama’s 17-000 capacity arena. Sunday’s event in Japan will signal the beginning of both the bantam and super-lightweight tournaments. 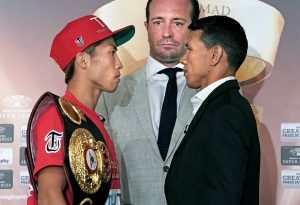 Headlining the card is WBA ‘Regular’ champion, Naoya ‘The Monster’ Inoue vs. former WBA ‘Super’ holder, Juan Carlos Payano. Already a two-weight world champion and 16-0 (14KOs), Inoue has had a sharp rise in the ranks since turning professional at the end of 2012. Fans last saw the Japanese phenomenon in May when he destroyed seasoned pro, Jamie McDonell inside one round in what was Naoya’s first fight since moving up from super-flyweight, to add the WBA ‘Regular’ to his ever-growing trophy cabinet. Juan Carlos Payano, 20-1 (9KOs) is no stranger to world title bouts. The Dominican southpaw briefly held the WBA ‘Super’ belt, currently owned by Ryan Burnett, before losing a rematch via majority decision to Rau’shee Warren. Since that 2016 loss Juan Carlos has scored three consecutive victors including a unanimous decision over unbeaten Filipino, Mike Plania. Kiryl’s opponent on Sunday is ‘The Eagle’ Eduard Troyanovsky, 27-1 (24KOs) fighting outside of Russia or Germany for the very first time as a professional. Troyanovsky, native to the Siberian region of Omsk, has loss just once in his 28 fights when he was knocked out cold in a shock loss to Julius Indongo, back in 2016.